Golden ears of sweet corn are one of summer's true delights! Many supermarkets and farm stands begin offering just-picked, locally grown corn in July, just in time for July 4th recipes. The harvest often extends well into September in many areas around the country. Our farmers' market fresh recipes collection features a section on corn, and we've got a grilling corn on the cob video as well as an article on how to grill corn on the cob. While simple steamed or boiled corn on the cob is the classic way to enjoy sweet corn, kernels cut from the cob are quite versatile. Toss them in salads, summer chowder and salsa, or sauté with fresh herbs for a quick side dish. Whatever way you enjoy it, get it while you can: Peak season is summertime. In general, yellow corn has large, full-flavored kernels and white corn has small, sweeter-flavored kernels. Bicolor corn has both yellow and white kernels. 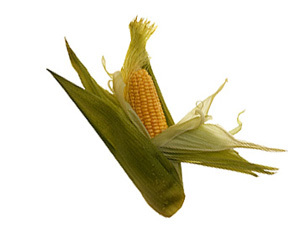 Select ears of corn with soft, bright green husks that fit tightly against the kernels. The silk should be golden and moist like grass. Avoid the urge to tear back the husk and inspect the corn. This causes the kernels to lose moisture and freshness. The natural sugar in corn begins turning to starch the moment the ear is picked. For the sweetest corn, use it on the same day it is purchased. Otherwise, refrigerate ears with their husks and silk intact for no more than 1 day. To shuck corn, strip the husks and silk from the ear. Snap the husk and stem off the bottom. Remove any remaining silk strands with a vegetable brush. Cut away any blemished kernels and rinse under cold water. To cut kernels from the cob, break the ear in half. Working with one half at a time, hold it upright, flat end down. Use a sharp knife to cut straight down between the kernels and the cob. One ear yields about 1/2 cup kernels. Ears of corn can be boiled, steamed, grilled, microwaved or roasted. Cut kernels can be boiled, steamed, sautéed or microwaved. Sprinkle buttered ears of corn with Kraft 100% Grated Parmesan Cheese instead of salt. Corn on the cob tastes great alongside grilled chicken or ribs slathered with your favorite Kraft Barbecue Sauce. Toss corn kernels in with the other vegetables in a mixed green salad and top with your favorite Kraft Salad Dressing. Stir about 1/2 cup corn kernels into corn muffin or cornbread batter before baking. Perk up your favorite chili or taco meat filling by adding some fresh corn kernels.